Poem and drawings of a little girl knitting mittens. Sitting on the front stoop, she knits while her cat plays with her ball of wool. In the other half of this image, the little girl tries her knitting on for size only to find her mitten is only large enough for one finger. This charming, vintage arts and crafts image of a little girl knitting mittens is copyright free and in the public domain. 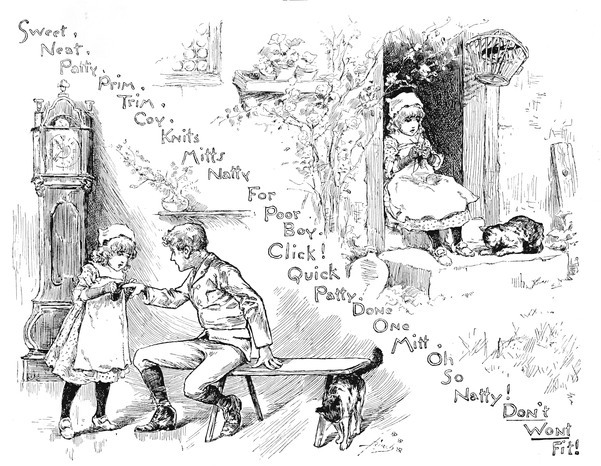 I found a number of great images in Baby World Stories, Rhymes and Pictures for Little Folks compiled by Mary Mapes Dodge (1830-1905) and published by the Century Company of New York. The work bears a copyright date of 1884 and does not identify an illustrator.